Hawaiʻi Island police have located and arrested 42-year-old Dale Daniel Arruda of Hilo, who was wanted for violating parole. 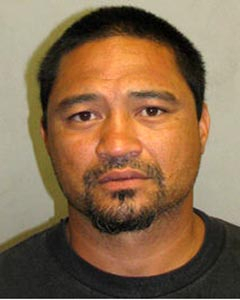 Arruda was arrested without incident at approximately 10:45 a.m. Tuesday (July 1) at a home in Pepeʻekeo. In addition to his arrest on the violation of parole warrant, he was charged with resisting an order to stop and second-degree theft relating to a prior law enforcement contact. His bail was set at $11,000. He is being held at Hawaiʻi Community Correctional Center pending his initial court appearance.